A WEEK today we’ll know who won, but the election race isn’t over yet. A WEEK today we’ll know who won, but the election race isn’t over yet. The Solihull News takes a look at the visits and events of the past seven-days. Sunday - Parliamentary hopefuls took part in a hustings at Light Hall School, organised by Shirley Residents’ Association and Shirley Churches Together. 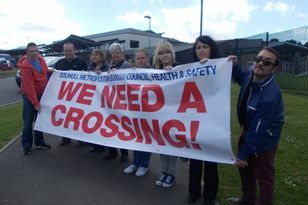 Monday - Shadow Health Secretary Andrew Lansley arrived in Solihull to join a protest about changes to maternity services. In north Solihull, the Labour team welcomed former minister John Spellar. Tuesday - Baroness Scott, president of the Lib Dems, visited Shirley High Street. She talked to shoppers about how they’d like to see the town centre developed. Wednesday - Elderly voters had their chance to grill candidates in a hustings held at Solihull Methodist Church. The Independent newspaper held a Q&A session with the candidates in Mell Square. Pupils at Langley School put candidates on the spot. The school said that it hoped the project would increase the youngsters’ understanding of politics and the voting system. Thursday - Lib Dem leader Nick Clegg was visiting Hall Green, ahead of last night’s third and final election debate. WHILE the leaders’ debates have caused a political avalanche, on a local level these clashes are a time-honoured part of the election race. CANDIDATES standing in the General Election will clash not once, but twice, in the next seven-days.